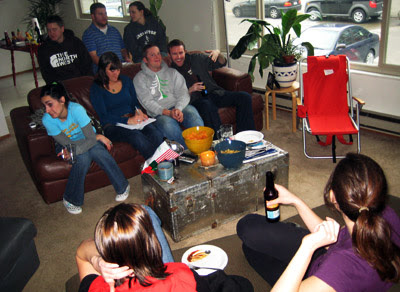 After spending all day Saturday and Sunday morning in the studio working on the focuspoint EP, I had a great time at the inaugural Ballard Burrow Superbowl Party. The hot dogs were tasty, the tater tots were hot and the beer flowed. Thanks to everyone who joined us! It was a tight squeeze with 16 people (nine of them pictured, kinda) in the apartment, and we all got rowdy during that eventful fourth quarter. My favorite commercials: Doritos Mouse Trap, e-Trade Baby and FedEx Pigeons.